DPJ leader: "I hope this victory will be for the people of Japan"
TOKYO, Japan (CNN) -- Japanese Prime Minister Taro Aso announced his resignation as head of the party that has governed Japan for decades following its apparent landslide defeat in elections Sunday. 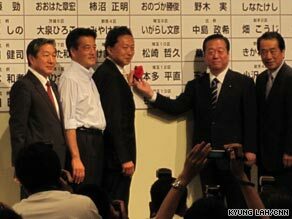 Yukio Hatoyama, third left, leader of the Democratic Party of Japan, celebrates the election results Sunday in Tokyo. Japan's voters, fed up with the party that has governed the country for decades, gave the opposition an enormous landslide victory in parliamentary elections Sunday, exit polls suggest. The polls indicate the Democratic Party of Japan (DPJ) may have won a 3-to-1 victory over the Liberal Democratic Party (LDP). Aso congratulated the DPJ in a televised appearance as the country waited for official results. Yukio Hatoyama, the DPJ leader, was restrained in his first public comments since the vote. In Washington, the White House issued a statement Sunday saying that U.S. President Barack Obama looks forward to "working closely" with the new Japanese prime minister. "We are confident that the strong U.S.-Japan Alliance and the close partnership between our two countries will continue to flourish under the leadership of the next government in Tokyo," the White House statement said. He pledged to raise the minimum wage and discourage hiring through agencies or on temporary contracts. That message is gaining traction in a country that is witnessing historic highs in unemployment and experiencing ramifications like homelessness for the first time. Voters at polling stations told CNN they wanted change and wanted to give new leaders a chance, even if they were not sure what policies would replace the ones that have run the world's second-largest economy for more than a generation. Lines at polling places spilled out into Tokyo streets Sunday as Japanese citizens showed up in what seemed to be record levels. Masayuki Nakamura, who voted for the DPJ, said he did so because he was frustrated with the lack of an economic policy as Japan emerges from its worst recession since World War II. "Maybe with this change of party, something will change," Nakamura said. "That's what I'm expecting. The money's been going the wrong way. I hope the money will now go toward jobs and creating a safety net." Before the election, poll after poll suggested the vote would oust the ruling LDP from power. The LDP has been in nearly continuous control of Japan's parliament for more than 50 years. But the country's economic crisis has disgruntled many who are displeased with how slowly the country is emerging from the downturn. Polls show the opposition, the DPJ, will snag more than 300 of the 480 seats up for grabs in the lower house of Japan's parliament. If the DPJ does win a majority, it will be the first time it will govern the country. Although a victory for the opposition would be of tremendous significance politically, it is too early to tell what practical impact it will have. Outgoing Prime Minister Aso's approval ratings dwelled in the teens, and his stimulus packages, while credited with lifting the economy slightly out of recession, are not being credited with helping households feel more secure about a lasting economic recovery.